Real-Life Shipwreck Survivor Helped 'Life Of Pi' Get Lost At Sea Thirty years ago, Steven Callahan survived a shipwreck and spent 76 days adrift on the Atlantic. Alone in a life raft, he fished and drank rainwater to survive. As a consultant on Life of Pi, he used his experiences to help director Ang Lee add authenticity to the film. Steven Callahan survived for 76 days adrift in an inflatable life raft. 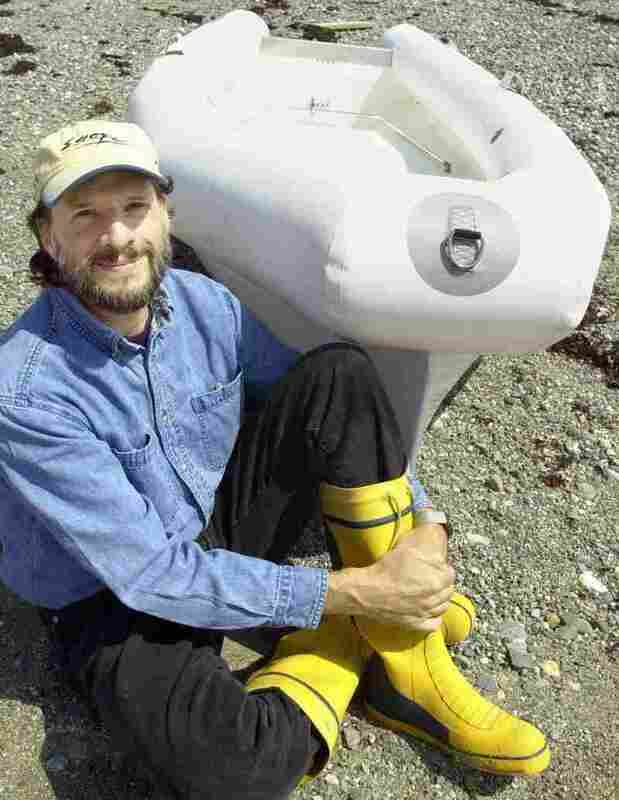 This 2002 photo shows Callahan with an improved life raft he designed after his ordeal. While enduring shark attacks, rain and helpless drifting, Callahan dreamed of a better survival vessel. Once he returned to land, he spent almost two decades designing this one, featuring a rigid exterior, a removable canopy and a sail. In Life of Pi, one of the nine Oscar nominees for Best Picture this year, a boy suffers a shipwreck and is lost at sea. It's a fictional story, of course, based on a novel, but director Ang Lee nevertheless wanted the movie to have depth and realism. But how do you add a realistic edge to someone drifting alone in the sea? For most people, even those in the imaginative business of movie-making, it's hard to picture the perils and isolation of months without rescue. Enter Steven Callahan, a shipwreck survivor whom Lee asked to serve as a consultant for the film. Thirty years ago, Callahan's boat sank, and he spent 76 days on a life raft. Like the fictional Pi, Callahan survived by harvesting rainwater and eating raw fish — and the story of his shipwreck and survival has Oscar-worthy drama of its own. "I was on a small boat, just over 21 feet," Callahan says, "and was sailing along, pretty much in the middle of the Atlantic." He was an accomplished sailor, on his way back from a solo crossing of the Atlantic, but he wasn't able to finish the return trip: His ship ran into a gale, and he suddenly faced increasingly large waves. "There was a big crash on the side of the boat, and a lot of water came flooding in," he recalls. "So part of me was frightened and saying, 'You're gonna die, you're gonna die, you're going right down with the boat,' and part of me was saying 'Shut up! Do your job!'" Callahan grabbed what supplies he could, jumped onto a 6-foot rubber life raft and tethered himself to the partially submerged boat to weather the storm. "Just before dawn, something parted in the line and I went drifting off, and basically spent the next 21/2 months crossing 1,800 nautical miles or about two-thirds of the way across the U.S., learning to live like an aquatic caveman." 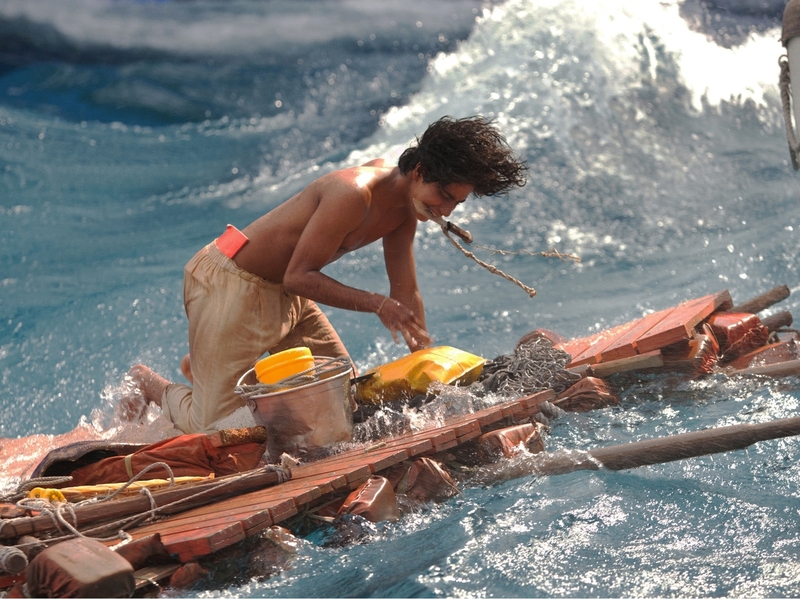 Callahan's aquatic caveman skills are an unusual area of expertise, and he used them on the set of Life of Pi to craft realistic props and help the actor Suraj Sharma convey the emotional ups and downs of a shipwreck survivor. Callahan joins NPR's Rachel Martin to discuss living through a shipwreck, consulting on a film and how survival experiences can contain hidden gifts. Callahan helped actor Suraj Sharma, who played Pi in the film, to convey the psychological distress of being stranded at sea. "Initially, sort of escaping the immediate threat, one's acting on training and instinct and all of those things, and its really afterwards, the second stage is probably one of the most difficult, having my life go by my eyes very slowly like a really bad B-grade movie, and regretting all my mistakes and errors, everything I failed, I failed my boat, I didn't have, in a lot of ways, a successful life. Even though I fulfilled these childhood goals of crossing the Atlantic in this small boat, it all just seemed pathetic, and slowly but surely I adapted. I tried to look at the voyage as a continuation, not an end, of the old voyage. I kept a log. I navigated." "Ecology started to develop — pretty much anything that floats in the ocean develops an island ecology. And fish would gather around it, and weeds and barnacles would grow. ...I've always felt spiritually touched when in wilderness environments, and this was that on steroids. I just got very attached to the fish which to me were kind of symbolic of the magic and mystery of life and the sea. They fed me, they became my friends at one point they almost killed me because they were big powerful fish and I was fishing for them primarily with a spear, and in an inflated raft, and they kept breaking the spear and at one point put a hole in the bottom of the raft. "And in the final analysis they brought my salvation, because the fishermen had come out to that side of the island that day, which they had never done before, and they saw all these birds hovering over the raft, which were there because of the fish, and they came out to find fish, and they found me as well." I had my 30th birthday in a life raft, I had my 60th birthday right in a hospital bed, but through it all, the same as while adrift, my wife and I have always found reason for finding gifts within the experience. "For me, it became quite the personal voyage because it's a continuum of my own experience 30 years ago. And to me, it's kind of amazing that the ocean that kept me alive would allow me to go down this path where Ang asks me basically to help him bring a kind of authenticity and believability to this film and always lobby for reality, and in that way, to make the ocean, as he said, a major character, which really it had never happened before as far as I know. I mean, most people set stories on the ocean but he wanted to bring out its diversity and its wonders as well as its horrors and scariness and trials and tribulations that it can place upon the human being." "I have to tell you that there are a couple of scenes in particular where Suraj just really nails the feeling, like when the ship is going down and he's on the end of the lifeboat, and just desperate, and seeing his family go down with the ship ... It's hard for me. It just touches — touches that nerve again. It kind of takes me back to all that desperation and regret. And there are other places in the film, too, where I think he just really nails it. When he catches — he catches a dorado, actually — and at the point he's pretty desperately hungry, and that's just another thing that takes me right back to when I caught my first fish. ... So there are parts of the film that were really touching. But I don't regret, you know, having gone through any of this or those feelings coming back because they — I think they made me a better person in the end." "To a large degree, you know, the survival experience has enormous commonalities. Initially, it's like, 'Well, you know, there's a very good chance I'm gonna die here pretty quickly and I'm not ready to die.' And ... I feel like I have fixed a lot of things in my life and ... I feel pretty filled with what my life path has been, which is quite different from 30 years ago. But I had my 30th birthday in a life raft, I had my 60th birthday right in a hospital bed, but through it all, the same as while adrift, my wife and I have always found reason for finding gifts within the experience. Just that preciousness of life that we seem to capture in the most desperate of times."